Here are the responses of our Japanese reporters, arranged in no particular order. Ice cream when I don’t have an appetite. ▼Ice cream when you have a cold!? We should have asked her which flavor she eats. Perhaps a non-traditional flavor, like this black sesame found in Japan? ▼Nothing like a piping-hot bowl of garlicky ramen to stave off a cold. Right?? Yomeishu (養命酒; an alcoholic beverage used for medicinal purposes), prepared in a 1:1 ratio with finely sliced ginger. I strongly recommend this. Chicken soup. My girlfriend is German, and she made chicken soup for me when I caught a cold. It was super effective, and ever since then I make chicken soup whenever I get sick. Honeyed daikon (white radish). I make this whenever my throat hurts, not necessarily when I have a cold. ▼Luckily for our readers, we already have an article with an easy recipe to make honeyed daikon! Throat drops–I often have a sore throat, so I always keep some around. Pocari Sweat–to rehydrate. I feel like it’s good for my body. Vegetable and egg soup–hakusai (Chinese cabbage) and other vegetables, topped with beaten egg. ▼C1000 juice. Incidentally, there’s a chain of Dutch supermarkets called C1000. ▼Head over to your local Japanese drugstore for some kakkonto when you feel the onset of a cold. Yunker (a health tonic containing Chinese herbal ingredients and caffeine which is marketed to combat fatigue). I only buy the good stuff that costs over 2,000 yen (US $16.66). ▼Kitsune udon is a popular dish made with udon noodles and a slab of fried tofu. Kitsune means “fox” in Japanese; the dish gets its name because according to Japanese mythology, foxes supposedly love fried tofu. Pocari Sweat–I buy up a lot of these and go through them like mad. Pocari Sweat is sometimes compared to an intravenous drip in bottled form, since it has all the necessary components to combat dehydration in your body. In other words, it’s not an exaggeration to call it a “medicinal” drink as well, and I always gulp it down when sick. If I drink a lot of Pocari Sweat, get decent sleep, and sweat a bit, I get better really quickly. As you can see, many of our reporters choose to eat okayu when they have a cold. 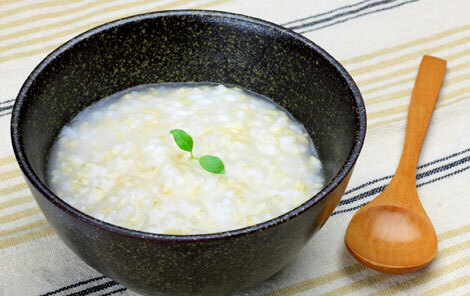 It’s true that rice porridge is the classic “eat this when you catch a cold” food in Japan, much akin to chicken soup’s status in the west. Other than that, sports drink Pocari Sweat, which is actually manufactured by Otsuka Pharmaceutical Co., proved to be quite popular in the responses as well. Its name may conjure up some unappetizing images in English speakers’ minds, but according to our Japanese reporters, it really is the best drink to rehydrate your body (and it actually tastes pretty good). You can buy it at any convenience store or vending machine, so why not give it a try if you ever come to Japan? ▼Pocari Sweat: has your opinion about this drink changed? Everyone, what kinds of things do you eat and drink in your country when you’re at home sick with a cold? Let us know in the comments section below!